Open the Administration tab -> Export data tab -> Products tab. The fields you want to export should be left in the Exported fields option. 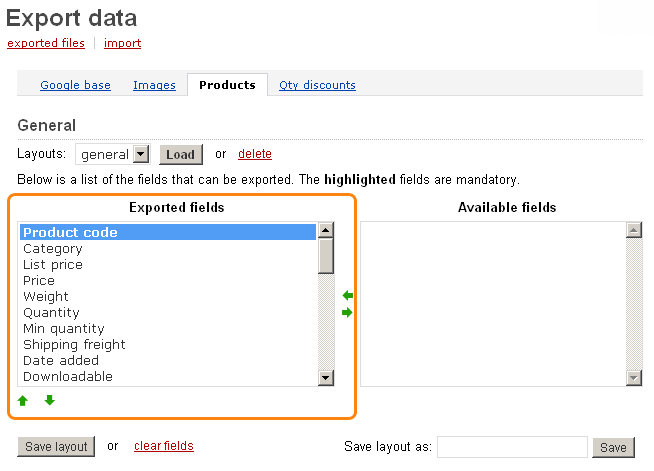 Select the fields you don't need to export and move them to the Available fields box by clicking on the arrow between the windows the Exported fields and the Available fields. Language - in the drop down list choose a language you would like to use in the CSV file. Category delimiter – specify the category title you want to export, for example ///Books///Children's books. Images directory - enter the path to the directory where you want images to be located. It is necessary if the image file path isn't specified the CSV file. Files directory - enter the path to the directory where you want product files to be located. It is necessary if the File field data path isn't specified in the CSV file. Direct download — if you choose it, you'll be proposed to choose the place on your computer where you'd like to save the file to. Server — if you choose it, product information will be exported to the file in directory var/exim of your CS-Cart installation. Screen — the product data will be displayed on your screen. Filename - enter a new file name the data will be exported to. In case Direct download is chosen in the Output option leave the existing filename in the input field of this option. In case you want to export the data of all products click on the Export button. Click on the Export button on the Export data page.